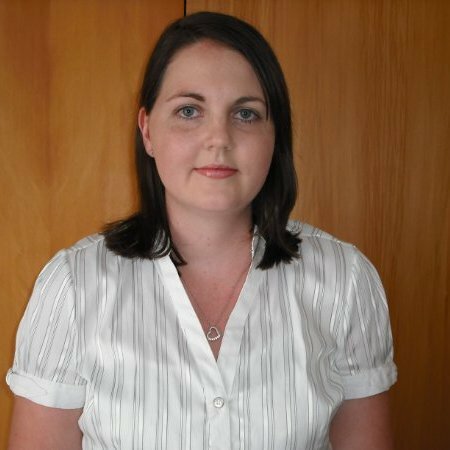 The article below was written by Emma Gordon, Business Support Consultant for Pohlen Partners. The uncertain and volatile environment resulting from the economic recession has led to many organisations turning towards the process of innovation. Organisations are looking for opportunities in the market to alter the products or services they offer, or to look for alternative ways to protect their already existing products or services. Innovation as a process is developed though the mobilisation of knowledge and skills. As a result, employees play a vital part in this process, as they are the resource that holds this knowledge. A question that then develops is: How can managers best assess whether their employees are being innovative? To ascertain this, managers must firstly determine which behaviours are necessary for the process of innovation. Multiple studies have focused on innovative work behaviours within a manufacturing context. This led me to question whether different contexts may require different behaviours for innovation. My masters thesis aimed to investigate what behaviours are necessary within a professional service firm. The global firm that participated in this study has an estimated 950 employees across five New Zealand branches. The study was split into two phases. Phase one consisted of face-to-face interviews with participants from a range of departments and levels of the organisation hierarchy (partners, heads of departments, managers, senior analysts and junior analysts). The purpose of this phase was to uncover what behaviours the participant believed were important for innovation to occur within their workplace. The aim of doing so was to find out whether there were behaviours that had not been considered as important by previous studies. These behaviours were collated into a list. The second phase was an online survey. This was to uncover the participants' perceptions regarding how important each behaviour identified in the discussion was. According to the participants within this study, there are around 23 different innovative behaviours that are seen as important for the process of innovation to occur. These behaviours are stated in table 1. Overall, it was found that these 23 behaviours were perceived to be important by the majority of participants in this study. Participants from different departments and different levels of the organisation did not differ in their opinions about what behaviours were important. There was also no difference in opinion with regard to the participants' demographics. This finding highlighted that for this particular organisation, there was a common understanding as to what behaviours are required by all levels of the organisation, departments and branches. However, whether this symmetry of knowledge would be similar for every professional service is undetermined. There has already been a range of studies regarding innovative behaviours; however, none have focused specifically on professional service firms. The results of this study have uncovered some new behaviours that have not been considered previously. Therefore it was concluded that he behaviours necessary for innovation depends on the industry of the organisation. In other words, the behaviours required to be displayed may differ for each industry. Managers and human resource teams need to work together, in order to find out what behaviours are required for their employees to display for innovation to occur. It was assumed within the study that innovation was a desired process within organisations. Statistics New Zealand has done studies showing that the number of organisations within New Zealand that engage in innovation is increasing. Therefore one would assume that there would be a great deal of understanding about what is involved in the process of innovation and why it is important. However, there was a mixture of responses by the participants in this study when asked whether they believed innovation was important. There seemed to be a difference in perception, not only regarding the importance in innovation, but also what innovation is. A participant who classed innovation as not important said this was because the organisation was seen to respond to changes in the environment, rather than coming up with those changes. For this participant this organisational response to market changes was not believed to be innovative. On the other hand, another participant stated that in order to respond to market changes and to make the internal process of the organisation more efficient, innovation was hugely important. There needs to be an organisation-wide mind-set that innovation is an important process otherwise this could hinder the innovation process in a number of ways. Firstly, if there is a negative response expressed by a senior member of the organisation to the process of innovation, then it may not be encouraged in the organisation. Previous studies have shown that whether an organisation is committed to an innovation programme is usually influenced by the senior managers in an organisation. Secondly, if there is a lack of understanding of the importance of innovation, then it is unlikely that personnel will question the status quo. In such a case, there is less likelihood of significant changes to the products or services, or the process of making such products. This study has determined the necessary behaviours, which can be included within human resources practices such as job descriptions and performance management systems. Firstly, having innovation as part of an employee's job description will indicate that innovation is part of the employee's role and will articulate how an individual can display the desired behaviours. Additionally, having innovative behaviours as part of a job description can highlight that innovation is important for that organisation. Innovation can also play a part in an employee's performance and reward system. An appraisal system could be produced containing innovative behaviours that are specific to a given industry. If this system is developed, then innovation performance can be measured and also rewarded. Such a system, in turn, would attract innovative individuals to the organisation, motivate existing employees to be innovative and promote an innovative culture. Therefore, simply knowing the behaviours that are required can ultimately reflect a variety of human resource systems. 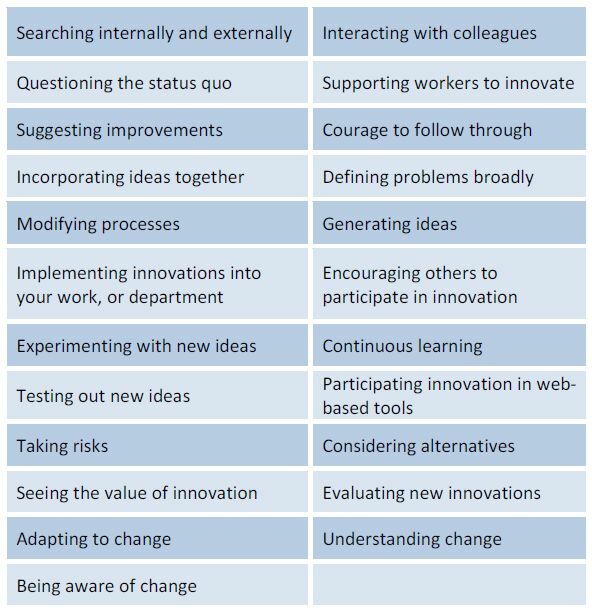 This study found 23 behaviours that were necessary for innovation to occur within the participating organisation. It was found that some of these behaviours were not included in previous innovative behavioural studies. As a result, it was concluded that the behaviours necessary for innovation to occur is dependent on the industry and the organisation. Therefore it is suggested that managers and human resource teams work alongside each other to extract the behaviours necessary within their firm. If this is done successfully the businesses can start to reap the benefits of being an innovative organisation.